I’ve frequently read that a blacksmith makes his own tools, and while that may be true I contend that a blacksmith is not the only craftsman who makes his tools. Glaziers who work stained glass will make several “fids” in the course of leading a window (or rubbing the foil down in the case of Tiffany style work). Engravers too may start with a store bought tool set but quickly progress to more specialized tools they make for themselves. Then there are ice carvers, who makes tools for ice carvers? They make their own or impress tools from other trades into their cold and wet work. I’ve also watched calligraphers take whole goose feathers and prepare/shape them into usable quills. Finally, woodworkers are constantly making “jigs” and “fixtures” so they can safely and quickly create their products. The shop has plenty of handmade tools to aid me during my work, and you can see a few in pictures below. Side note: A jig is used to register (hold) the work piece in relationship to the tool. A classic example is a cross cut sled for a table saw, you put the work piece on the sled and push the sled into the blade. Since the sled is fixed in relationship to the blade, the work piece is cut exactly as desired. In short, jigs move the work into a fixed tool. On the other hand a fixture is designed to hold onto the work so the tool can be accurately brought into contact (the tool must move relative to the fixed workpiece). 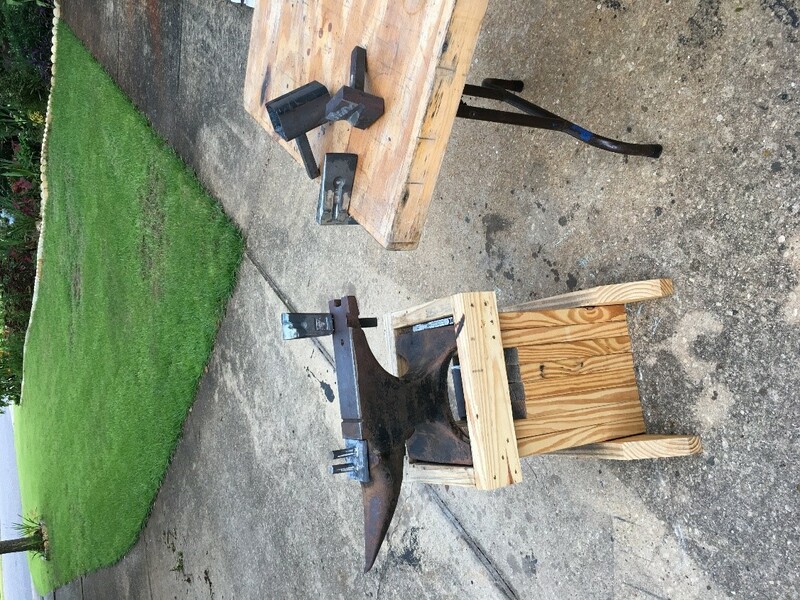 A simple example would be a bench vice that holds the work for a chisel and mallet. 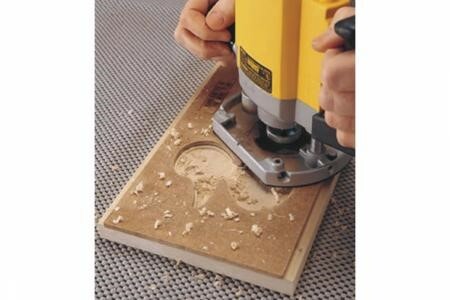 More elegant are the patterns used with a router and a bearing bit; the work is fixed to the table, the pattern attached to the work, and the router with a bearing is used to follow the pattern. The Krig tool is another example of a fixture – even though it is frequently and incorrectly called a jig. However, in this day and age why not just buy your tools? Maybe because the utilitarian approach of the production line renders the product uniform and impersonal? Yea that sounds good, but I have to admit I make my tools to save money. $75 for a cross cut sled that I can make out of scraps from my last project just puts me off. When I saw the cost for blacksmith tools it took my breath away! $50 for a hot cut hardy tool? That’s just a wide cold chisel that fits into the hardy hole in an anvil. So, I went to Harbor Freight (my favorite place for cheap one shot tools) and I picked up a “Big Head Stone Mason’s Chisel” for $5, even less with their ubiquitous 20% off coupon. A few minutes with a grinder and it fit the hardy in my anvil. That was easy! Now I have a hot cut hardy. But I also have the bug to make more tools. I went down to my local steel supplier and walked through the yard and picked up all the short off cuts and scrap I could carry, cost me $15. I also got a 5 Lb. Wood Splitting Wedge, again from Harbor Freight. Then an afternoon with the grinder and my gas welding rig I now have: (left to right) a bending fork in the hardy, sitting on the tale of the anvil a bottom fuller with two radius – that was the bottom half of the wood splitting wedge, a hot splitter – similar to a hot cut but used to split hot steel bar for ornamentation (yep, that the other half of the wood wedge), an anvil saddle for making two prong hooks/forks and a cone stake for making candle sticks. One lesson learned, since I don’t have a welding table I used my anvil as a work bench. Makes sense since that’s where the hot work goes out of the forge but there is a big draw back. Welding thick parts like these requires a lot of heat and the anvil is a big heat sink. It might have been better to set up some firebricks on the workbench and weld there instead of on the anvil. I used a third of a class “B” size acetylene tank and one class “A” bottle of oxygen to achieve my results.